As the Official Workout and Practice Planning Tool of PONY Baseball and Softball, Dugout Captain is proud to offer FREE membership to all participating families. See below for a description of benefits and sign up for free today. Coaching baseball is hard, especially when the athlete is your own kid! The mission at DC is to make baseball fun again, by supporting a positive, safe, and developmental environment for ballplayers to grow as athletes and individuals. We do that through drill videos, practice plans, and training lessons, all built upon the philosophy that we CAN train champions and prepare them for the big leagues, while also ensuring that they have a smile on their face. It is our belief that the pressures, experiences, and adversities faced through this wonderful game teach life skills and character traits the way nothing else can. JOIN THE MOVEMENT TO MAKE BASEBALL FUN AGAIN. Membership is FREE for all PONY members (really, there's no fine print). Coaches, parents, aunts, uncles... find a way to get someone better. Play hard, have fun! Hook up EVERY coach in your league. Let DC do the work and make you look like a hero! Created from real-life experience working with the most challenging athletes. All drills include video, descriptive text, set-up diagram, and patented DC Keys providing tricks and tips to save time and frustration. Ready-made practice plans programmed to prepare athletes at each age level. Following the bullet point objectives laid out in the Athlete Development, plans are filled with DC Drills - and each has specific notes for THAT drill's use at THAT practice. Step-by-step developmental curriculum to guide the coaching process. Bullet point learning objectives by age, with the plan to accomplish them. No stress, what to expect, tricks of the trade. 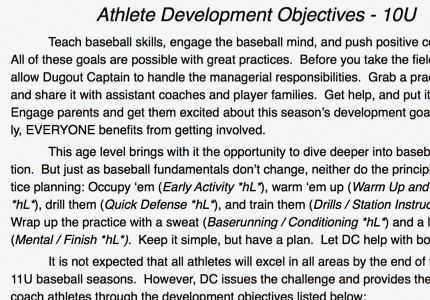 DC Practice Plans programmed to reach Athlete Development Plan goals. Coach-the-Coach guide to train skill development in pitching, hitting, infield and the catcher position. Fix-it plans for correcting fundamental flaws and problems. Coaching Tips included to assist game management, handling umpires, parent problems, and best practices. Select a ready-made plan or build your own via DC Virtual Clipboard. Then SHARE to athlete, parent, assistant coach, or team. Control panel to launch into action. Build a team, invite player families, store plans, find resources, connect with other coaches.